You have found your dream home!! This is one of the finest homes in Sun N Lake. Located on the 4th tee of the championship Deer Run Golf course. New roof and A/C in 2017, new double pane windows in 2015, gutters all around and a custom painted driveway. This home has 14 ft. ceilings, 8 ft. doors with lots of crown molding and 6" baseboards. An open concept split floor plan design which makes it perfect for entertaining. The kitchen is a chef's delight, stainless steel appliances, an island with pull out pan drawers, granite counter tops and plenty of high end custom cabinetry, a pantry with pull out shelves. The upgrades go on and on, custom plantation shutters throughout, even the garage, French doors to the lanai have enclosed mini blinds, the custom tile floors have designer inlays. The oversize master bedroom has wood flooring, tray ceilings with indirect lighting, french doors with enclosed mini blinds that opens to the pool and lanai area. The master bath has a marble vanity with his and her sinks, Jacuzzi tub, walk in shower and a large walk-in closet. Large caged lanai has a heated pool with Pebble Tec finish. A custom bar in the lanai over looks the golf course. 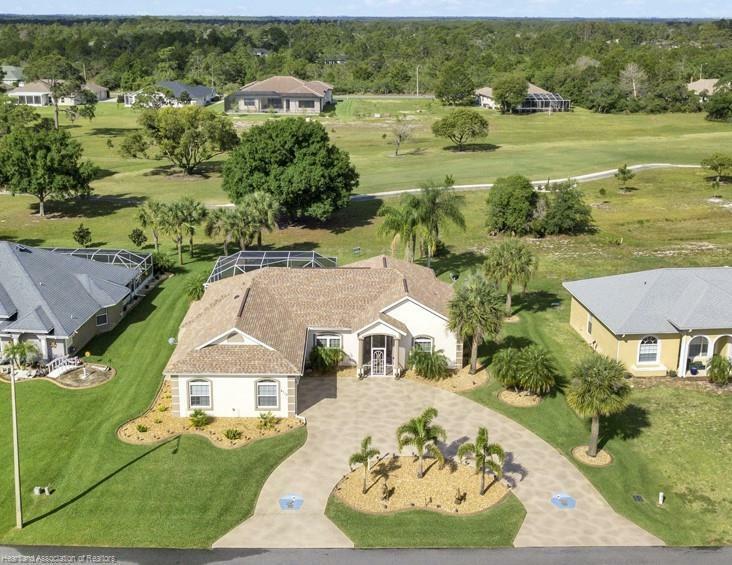 Remember first time buyers to Sun n Lake are eligible for a free 1 year golf membership, (some restrictions apply) Sebring has wonderful access to medical facilities, doctors and schools. Don't delay!! Kitchen and lanai bar stools will remain as well as the large mounted television in the living room . A furniture package could be discussed.